The Sungei Road market in Singapore will soon become a part of history as curtains are set to fall on the location on July 10. It will be the last day of this free hawking zone. The government is working for the rehabilitation of the vendors through various assistance options, including employment and financial help and facilitation of applications for hawker stalls at other places. However, only 44 out of the 200 vendors at the market have turned up for the rehabilitation. Till now, 23 vendors have applied for hawker stalls, of which 20 have been allocated lock-up stalls at Chinatown Market, North Bridge Road Market and Food Centre, or Upper Cross Street Market. 70 vendors have indicated that they did not need any help,being able to support themselves or find other jobs on their own. Fifteen vendors have been granted financial assistance through ComCare, and the MSF is partnering the Central Singapore Community Development Council to refer vendors who might need more help to other assistance schemes. On those who have declined any help, Leong said the authorities “will continue to keep in touch with them, and help them with the various assistance options should they wish to apply for them”. 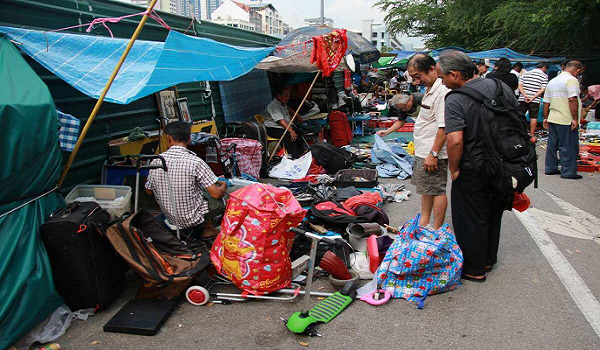 Sungei Road market is the oldest and largest flea market of Singapore which has also been dubbed as the Thieves’ Market and can trace it roots back to the 1930s. However, this market would soon cease to exist. The government has announced that the site would be set aside for ground preparation works for future residential development use.